I started parenting habits prior to the "dreaded teen years" that I hope will carry my influence further and create a positive relationship with my teens. It was during my 13-year-old's annual checkup that the doctor informed me that my parenting days are numbered. "You no longer have the greatest influence over your teenager. In fact, you come in fourth behind friends, teachers, and his doctor," he told me glibly. While I mentally threw a tantrum over his blasé inditement on my role as a parent, I considered whether I was willing to tuck my tail and move to the back of the line. Admittedly, as I've moved into the role of parenting a teenager, the time that we spend together has been more restricted. Of course, that limits my overall influence, but I'm completely unwilling to watch from the back and hope for the best as my kids traverse their most formative years. Fortunately, by a heap of dumb luck, I have built some habits prior to the "dreaded teen years" that I hope will serve to carry my influence just a bit further and create a positive relationship with my teens. So much of successful teen parenting is about getting face time with them. So many other things vie for their attention that parents have to be diligent about getting noticed. Setting a habit to have one meal together every day carves out a time for all of you to reconnect. Put away your phone at the table and when you drive. I'll admit that this decision was first driven by fear and guilt. In other words, I felt guilty for wanting to surf Facebook while eating dinner, and I was fearful that if they saw me texting in the car, they would mimic that behavior. Sometimes fear and guilt serve us well. This is a habit that has helped to set a standard for how we interact with each other in the digital world. The times at the table and in the car are the most concentrated conversation moments of our day. I'm glad that we have all learned to put away the gadgets and use that time to connect. Set aside time to talk about their day. I'm sure you're starting to notice a trend. When it comes to teens, the biggest challenge is grabbing their attention. Before the busyness of high school hits, make sure you have a habit of checking in with each other every day. Maybe it's through text or email, but make it consistent. When your grown child calls you every Sunday, you'll thank yourself for the effort. 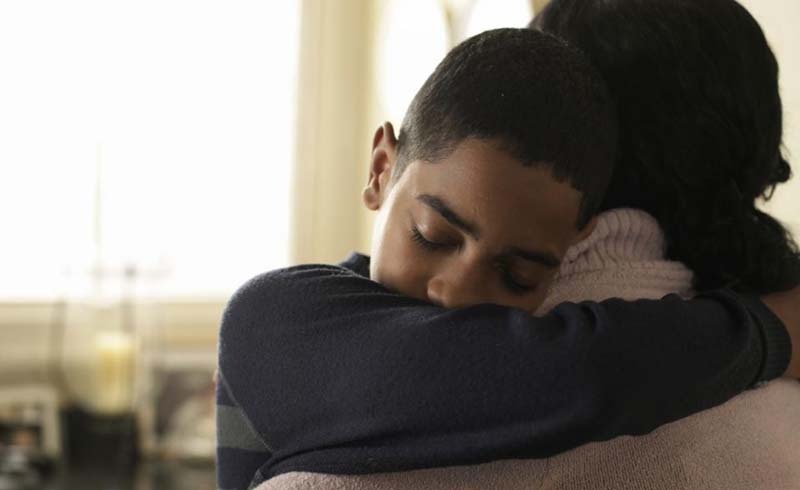 "Mother of Family Therapy" psychotherapist Virginia Satir said that people "need four hugs a day for survival, eight hugs a day for maintenance, and 12 hugs a day for growth." Teenagers are definitely growing in so many ways, but they're not often cuddly. As kids hit the preteen years, make an effort to find new ways to keep the physical contact up. Maybe it's a quick scratch on the back or a smoothing of the hair. It doesn't have to be prolonged, but it has to be present. Technology is constantly changing, and consequently, blowing right past the parents of teenagers. It's almost expected that parents will be in the dark about the latest app. That is a dangerous place to be. By the time they hit the teen years, kids should be used to you knowing about what's new in their tech world and checking on how they're using it. While you're at it, put limits on their technology use and keep that up during the teen years. Spend time with their friends. While it's said that you can't choose your kid's friends, you can certainly know who they are. With such a high possibility of getting left out of the loop, knowing who your kids are with and what they're doing is key. Start this habit by being the parent with the best playdates, so your kids will be used to having you around with their friends. And heed this warning sign: if your kids are talking about people who you've never met and don't know anything about, it's time to get acquainted. As soon as my kids start talking about Creepers, TNT, or anything related to Minecraft, I start wishing I had a dentist appointment to get me out of the conversation. The things that interest my kids are often boring to me, but because it matters to them, I pretend like it matters to me. Being willing to understand what matters to them is a huge relationship builder that carries over into the teen years. Find a hobby to share. When my son turned 10, we started running together and training for short races. It helped to burn off his pre-teen hormones and jumpstart my 30-something metabolism, but it also gave us another commonality and bonding point. Now, that he is a teenager, he looks forward to our runs (mostly because he is faster than me), but also because it's something special that defines our relationship. Conventional parenting wisdom holds that the first three minutes after kids wake up and the last three minutes before they go to bed are the best times to connect with them. The magic behind bedtime conversations is simple: kids will do anything, even tell you the details of their day, to stay up a little later. Prior to the teen years, this is a great time to catch up with your kid, but it's a habit that should definitely continue as they age. Turns out, teens are just as willing to talk, and there's an even more serious reason why checking in at night should be your habit. If kids are going to start making dangerous choices, the evidence of those habits will be more obvious at night. We have checked in on our kids at night to find that they've snuck their iPads to bed or they're eating junk food after bedtime. More importantly, though, teens are so much more likely to get in trouble, including sneaking out, when they feel like their parents have gone "off-duty" for the night. Checking in reminds them that you're always present. Let them fail (or succeed). At the beginning of this parenting gig, you were quite literally responsible for your child's survival. Remember, the early years—what I like to call the "death watch" period—when you got to the end of every day grateful that they hadn't ingested bleach or fallen down the stairs? That kind of vigilance is a hard habit to break. It's best for parents to start early to begin to train themselves to give their kids space to try things on their own. That way, when it's time to let them go for good, you have enough practice to actually be able to do it.